My daughter and I had our first go at paddle boarding today, and we really enjoyed it. We checked in with Jay and Rod, filled in a quick form and then were given our boards. These were selected to suit our individual height and build and our paddles were altered to give us a personal fit. ...... Jay took us into the water an encouraged us for the whole lesson. It was great value for money ... Thank you so much Rod and Jay, we had an amazing time! Talk about fun! And absolutely no dramas. Staff were so friendly and explained everything well. We were on the water just a couple of minutes after arriving on the beach. Great value too.We will definitely book again next time we're there. I signed up for a half hour and was given a thorough lesson. My instructor really explained it well and I felt the respect she has for the environment and loves her job. I enjoyed it so much I want to buy one of their boards! Great thing about SUP is the exercise and having time and a perfect view of what's in the water and the distant setting. Great value for money and quality instructions. Not just a hire facility but an education and responsibility to the sport and environment. Shoal Bay is Located an hour North of Newcastle , two hours from the central coast and tree hours from Sydney. It is a great location within Port Stephens to learn and experience Standup Paddle-boarding (SUP). 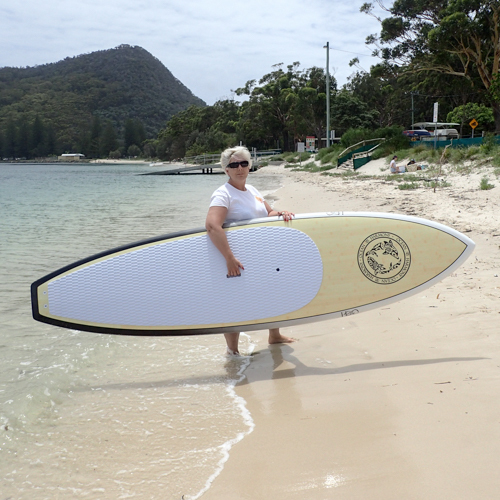 For a tourist visiting the Port Stephens a day paddleboarding in Shoal Bay is a essential experience. At Shoal Bay SUP we want to provide you with the ultimate Port Stephens Paddleboarding experience. Our ASI (Association of Surfing Instructors) accredited instructors Rod (ph: 0428604460) and Jay (ph: 0431910648) will get you on your paddleboard and doing it the right way. All our paddleboard hires come with a introductory lesson for beginners included in the hire fee. Your lesson is prior to your hire and is not included in your hire time allowing you to learn the basics of Stand Up Paddleboarding before you get out on the beautiful waters of Port Stephens. 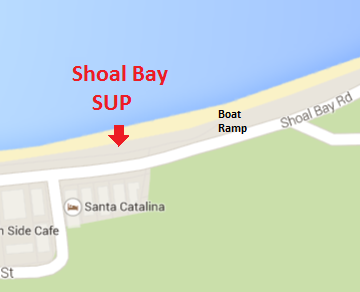 Our SUP school is located on the beach 100m west of the Shoal Bay boat ramp, towards Tomaree Headland. This location has been especially chosen for our Port Stephens paddleboard school as it is less crowded and is the most sheltered part of shoal bay. The area around our site is also a designated 8 knot zone which ensures your paddleboarding experience isnt disturbed by the waves or wake of jet skis or other boats travelling at speed. Our site is also beautiful as the area in front of our site is relatively shallow 4-8m so you have a very clear view of the seagrasses and the marine life below. You will see fish but also may see dolphins, turtles, cormorants and other types of wildlife. Our instructors and staff will also with permission take photos of your paddleboarding experience so that you can enjoy what you have come here to do and still get the photo memories to take home with you. Our paddleboards are mostly bought this season. We will match you to a stable board that will match your size so that you have the best experience possible. For the already experienced we also have full carbon race/training paddleboards for hire or demo. If you are visiting Port Stephens and Standup Paddleboarding is on your list of things to do, make sure you visit us at Shoal Bay SUP. We will make sure you get onto the water doing it the right way and have fun at the same time. down near the boat ramp is very sheltered except from the summer prevailing north east winds. This area is also an 8 knot zone so very safe to learn to paddleboard. We have very family friendly prices and special pricing when you come back again as we know you will do time and time again when visiting Port Stephens. Reserve your spot online for Special Price of only $25 per person.